I've been on Facebook for ten years this September. And I still have less than 200 friends on my list, because I've always tried to have actual relationships with the people on my list (well, except for the high school boyfriends, they're just there so I can sticky beak on their lives) There are long time family friends, family members, people I've met through scrabooking forums (back when forums were a thing), there's bloggers I've clicked with, and university friends and even school mum friends. But when crisis hits life, it's interesting to see how those friendships play out online. 1 - the friend who doesn't want to comment, but sends a private message. Whether it's because they feel unsure about how their comment will be perceived, or because they're really not offering any advice but want to offer support, I had a few of these messages over the course of the weekend. Some were from people I hadn't spoken to for years, and some were from people I'm really close to. But their support meant more than they'll ever know. 2 - the friend who was the voice of reason. I have some friends on my list that I don't know very well, they're just sort-of there because they're there. I enjoy what they share, I sometimes chat to them, but I don't really know much of their background story. These were the people who provided the voice of reason, and helped keep me focused on finding an answer. And I was quite surprised to learn more about them, thanks for sharing your story! 3 - the friend who's got your back. Sharing things on facebook can sometimes bring out the judgement in people. I knew before I posted who would judge, and I was right. But what I didn't expect was the friend who got into a scrum with Ms Judgey, and put her in her place. And Ms Judgey has been removed from my list at last. 4 - the friend who gives support from afar. One of the beautiful things about the internet is you can often forget just how far apart our countries really are. And I'm lucky enough to have some friends from England, America, even Spain, who have provided me support for years. They've read blog posts, sent Christmas cards, and even created scrapbook pages for me. And with every ounce of my being I can never thank them enough. 5 - the friend who is an expert. Blogging has brought so many different people into my life, and I've been lucky enough to connect with one person who actually has a similar family make up to us, and is also working in the field. She was also a voice of reason, but I had to point out that her support didn't go unnoticed. 6 - the friend who comments because they can. Like the friend who sends private messages, the friend who comments because they can doesn't really offer any advice, but lends a shoulder to cry on. When it feels as if you can't keep fighting against the world on your own, those friends remind you that you are strong enough to make it through today. 7 - the friend who's advice you're not going to take. This is usually a family member who has been on the receiving end of teary phone calls, and is at their wit's end trying to help you. They know you're not going to do what they suggest, but they need to get it off their chests anyway. They also go to battle with people, trying to be the voice of reason, but it backfires. And you chuckle quietly to yourself, because you know their heart is in the right place, but you ignore them anyway. 8 - the friend who makes sure you're ok the next day. Life usually looks a little better after a good night's sleep, so these friends don't offer advice until the next day. They want to make sure you're still comfortable with your plan of action, and that tempers haven't flared again. And by touching base when things have cooled down, they say "hey, we know things are tough, but we're here" in a way that isn't always visible online. 9 - the friend who brings wine and chocolate to your door at stupid o'clock. This friend blew my mind a couple of months ago, and knocked on my door with wine and chocolate. And I ugly-cried on her, and small-talked, and we went on our way back to life. But that one little action was so powerful! 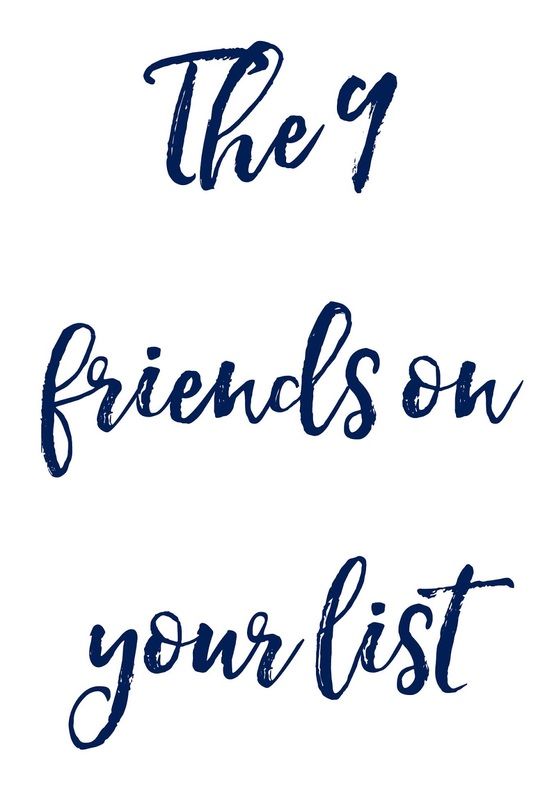 All in all, it seems that I have way more friends on my list than I thought I did! linking up with Capturing Life for IBOT. I enjoyed this post, Cate. You've definitely highlighted the types of friends I have in my own Facebook-o-sphere and it's hugely relatable. What a lovely post Cate. That's a very thought-provoking list, Cate, and very enjoyable to read. You could submit this to a magazine - it'd make a great article.